About six months ago I posted a video showing a GPS track with 7,000 points in a slippy map control called DeepEarth. If you watch the video you can see that the track lags behind the map a little and I think I was at the limit of what was usable. There are a range of pan and zoom map controls (sometimes called slippy maps) available for C#/.NET and Silverlight/Moonlight. All the ones I’ve seen have something in common – they are bloated. The authors attempt to address the needs of as many users as possible and the result is large downloads and far too many features. The forums and mailing lists are full of people asking how to achieve basic functionality because they are lost in the vast realm of classes. Of course, it is possible to remove what you don’t need but that requires understanding the code and after all that effort you are left with code that might not have the right license for your needs. The solution? Time to cringe – reinventing the wheel. Using data from the OpenStreetMap project (taken a couple of days ago) along with some utilities such as Maperitive and custom software, I have generated a 39 inch x 31 inch poster of the East Riding of Yorkshire. This map includes hillshading and contour lines and individual streets can be seen. Some assembly is required. Print it out on A4 paper, cut out the sheets and then glue them together. Download it here. So You Want to be a Cartographer? Love maps? Want to make your own? Now it’s easy thanks to a set of free software. Previously I wrote about the OpenStreetMap project, which allows anyone to edit a map of the world. People can add points, lines and areas and “tag” them to show what they are. Once the data is uploaded a new version of the map is generated for everyone to see. For example I could create a point on the map and tag it with “railway=station” to indicate that it is a train station. I could draw a line and tag it with “highway=residential” to mark the line as a residential road. I could also draw an enclosed area and tag it with “landuse=forest” to show that the area is a forest. There are many different tags that can be used to represent all kinds of things that appear on maps. 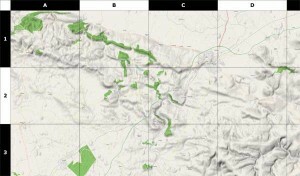 This article is in the form of a tutorial to get you quickly started creating your own maps. I will introduce the software involved and show how to use it step by step. The result of the tutorial is a map of the North Yorkshire Moors Railway, which is a steam train service on a historic train line in England and is featured in the Harry Potter films. DeepEarth is an interesting Silverlight project. It allows interactive tile-based maps to run in a browser with overlays of custom data, however it suffers from some performance problems. ElementUpdate recalculates the point positions on every map movement. This produces an accurate track display but gets slower as the number of points increases. PanOnlyUpdate recalculates point positions during panning and hides features while zooming. Not too useful for me and didn’t seem to show anything anyway. TransformUpdate draws the tracks to the map once then scales and pans the vector graphic in synchronization with the map. This makes it very fast. Sadly the scaling code is flawed. Lines disappear as you zoom in and sections of the tracks become distorted, almost looking like calligraphy. I recently embarked on the process of adding the shapefiles for Region 3 of the US Forest Service into OpenStreetMap (OSM). This post describes the method I used. First a bit of background. OSM is a free street level map of the world. Just like Wikipedia is a encylopaedia that anyone can edit, OSM is a map that anyone can edit. The data is licensed under Creative Commons by attribution, which is a very liberal license. In the US currently most of the data came from a mass import of the US Government’s TIGER data. This data has numerous problems, such as streets being in the wrong places and regions like forests are missing completely. Fortunately some regions of the US Forest Service make good quality shapefiles available of the forest boundaries and I live in one of those regions – the Southwestern Region. It’s just a matter of converting the shapefiles into the correct format, adding some descriptions and uploading them to the OSM server. There are several challenges with getting the data into OSM. Firstly the shapefiles are in the Lambert Conformal Conic projection, which is not what OSM uses. Secondly OSM doesn’t use Shape Files, it uses it’s own XML data format. Thirdly the data has to be “tagged” in the correct way for the forests to be rendered correctly. This becomes more complex if there are holes in the forest. There are some essential plugins that are required. Install utilsplugin, validator and waydownloader. Here are the steps I used to edit and tag the data. There may be mistakes, so use at your own risk. To the left of the way in the dialog window set the role to “outer” for outside rings. Set the role to “inner” for inside rings. Validate and fix errors. Ignore warnings about unclosed ways. Do not add tags to inner ways or the nodes. GPSBabel automatically adds tags, so delete those. would be the fourth upload for July 10th 2009 by the user FooBar. I use this scheme because I can work out the uuid’s from just an upload date and it is very unlikely that someone else would use the exact same uuids.